Banana Blueberry Muffins. My husband and kids just love muffins. Mostly because they are a great snack for on the go. After my Lemony Blueberry Muffins were such a hit here, I started to think about other great blueberry combinations. So that is how these banana blueberry muffins were born. 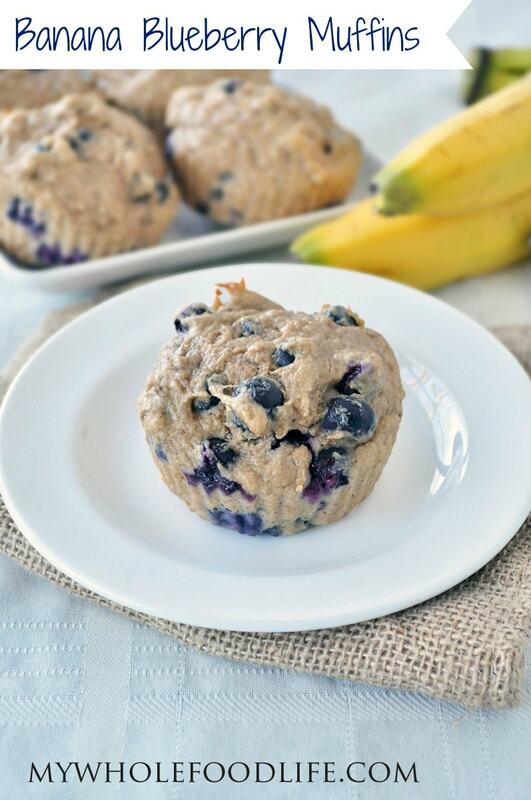 This banana blueberry muffin recipe is made with whole grains and no oil or butter. There is also very little added sugar in each muffin. They are mostly sweetened with fruit. These muffins are so moist, you would never guess they contained no oil! They are also gluten free and vegan. 🙂 Very kid friendly. I made mine into jumbo muffins, but you can make standard sized muffins as well. Here is a quick little video of me making these if you need a visual. For more videos, you subscribe to my You Tube Channel. A simple and healthy muffin recipe! If you are not gluten free, you can use regular flour for this recipe as well. It would be an equal substitution. Store the muffins on the fridge in an air tight container. They should last up to 2 weeks that way. You can also freeze them for longer. Enjoy! I'm not sure why mine are not working out. I followed it to a "T", but my muffins have been in the oven for almost 20 mins now, and still not fully cooked. These are really yummy! Made a batch tonight as part of our breakfast for this week and I am trying one now. Love that they are healthy. My husband and daughter loved the taste too. Thanks for sharing! You are so welcome Celeste! I am glad you like them! if i use wholemeal flour will the measurements for the ingredients be the same? I am not sure, but I am going to guess yes?